One question I’m often asked is: What’s the best way to keep my jewels in good condition? 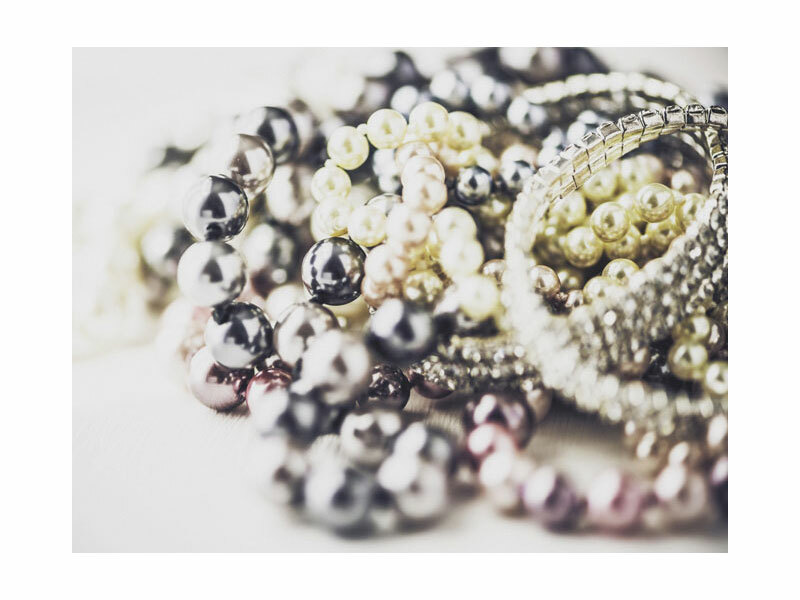 Here are some tips for storing costume jewelry. Put your pieces in a clean and dry place, away from a heat source. Keep you jewelry organized to avoid tangling and damage and to enable you to easily find what you want to wear. Choose a container divided into compartments so the pieces don’t touch each other. Or put individual pieces in pouches or bags to keep them separated. Keep sterling silver in tarnish-resistant cloth. Get into the habit of putting away the pieces you’ve just worn when you take them off at the end of the day. You may want to keep your jewels out of site in velvet-lined, divided drawers in a dresser or closet. Here are some storage options that are beautiful to look at and that allow you to get to your pieces easily. 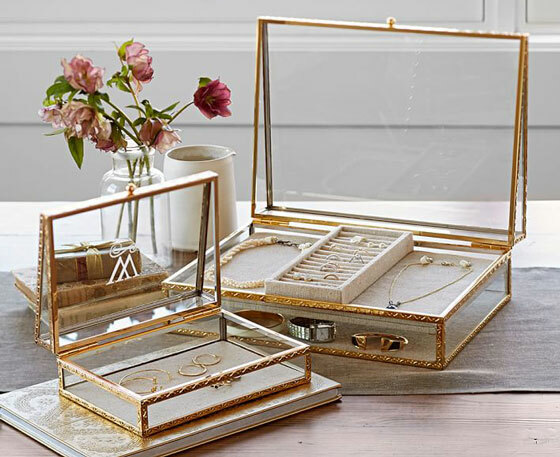 The Antique Gold collection of glass jewelry boxes from Pottery Barn make for beautiful displays on a dresser or bedroom vanity. 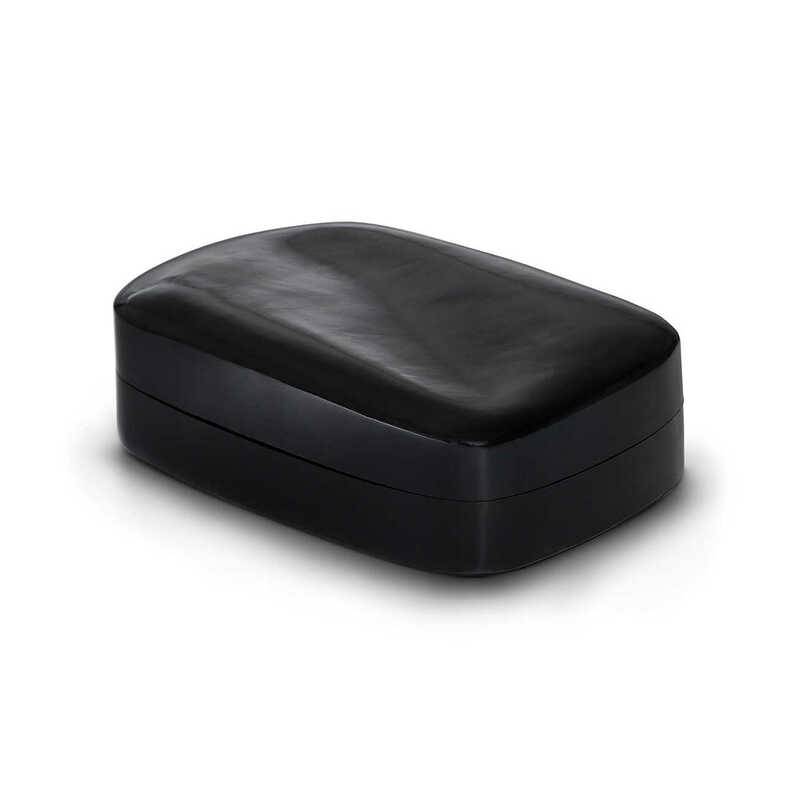 Definitely not a traditional jewelry box, Tiffany’s Wave Jewelry Box by Elsa Peretti® is understated and elegant in warm Italian leather. This beautiful idea comes from MarthaStewart.com (of course!). 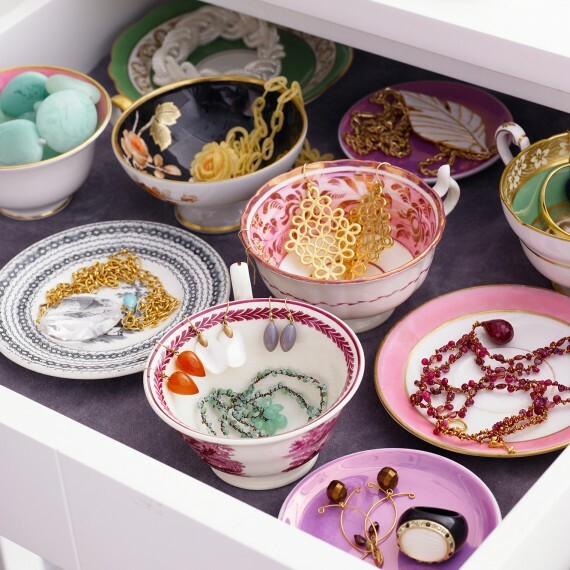 If you’re not using those vintage teacups for Oolong, they might have a happier life tucked in a drawer with your baubles. 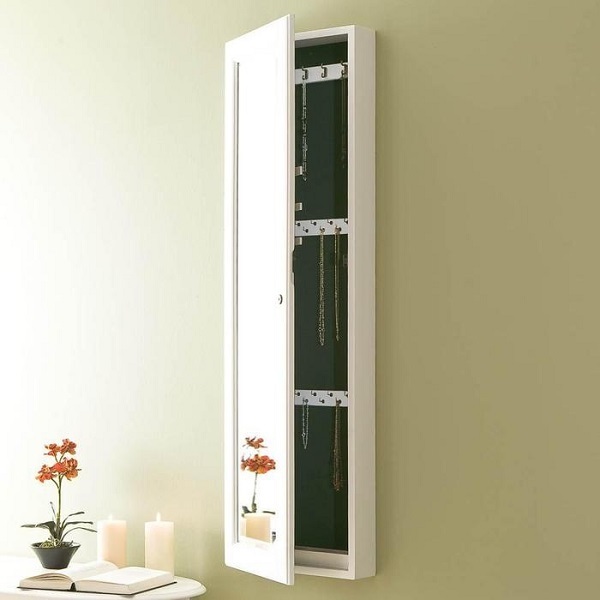 If space is at a premium, consider hanging a mirrored jewelry armoire in your closet, bedroom, or even the upstairs hallway. A pretty leather jewelry roll is perfect for travel but can also be a convenient way to store your go-to pieces every day. Wolf offers a selection of styles, sizes, and colors that look like wallets. 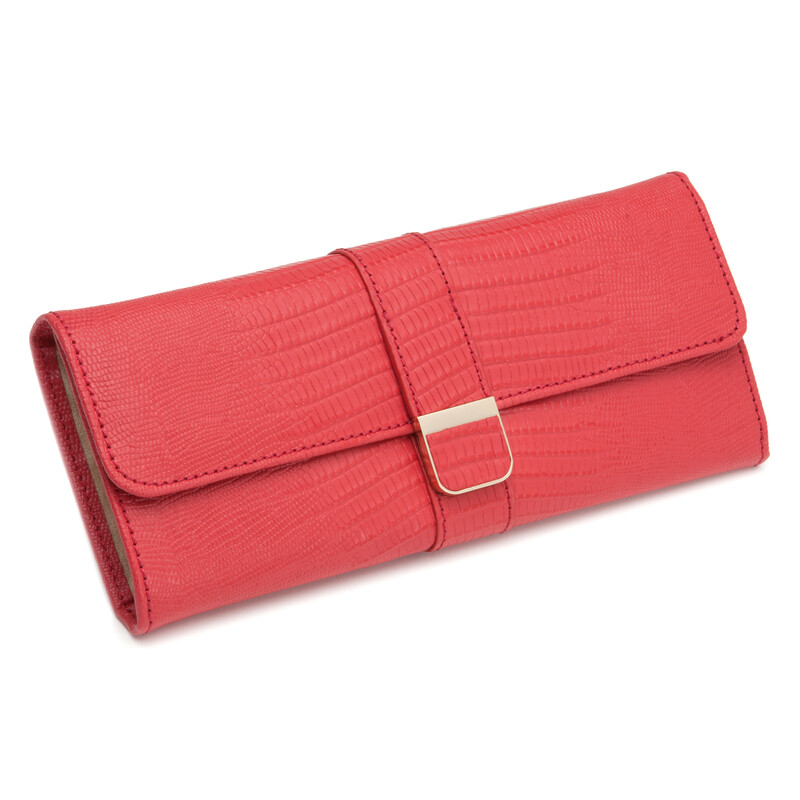 This style (called Palermo) is available in coral, brown, and blush. 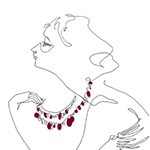 I invite you to browse the TruFaux Jewels boutique to fill it with sparkly vintage pieces. Another useful idea is to take an empty picture frame & nail or staple some fine mesh to the back of it – perfect for displaying pierced earrings. Great idea! Thanks for sharing, Patricia! For decades I struggled with how to store all my bijoux. I used to import costume jewelry from Paris and Milan, so I had a lot of my own pieces, which was overwhelming enough. When my mother passed away, I inherited hers and her mother’s, too, so now I have triple the amount., ranging from Victorian to Deco (my fave) to 14K gold to Native American and more. I got by with a variety of boxes shelved in my dressing closet plus a couple of those hanging plastic compartment numbers. Mother always kept her jewelry in a really ugly but practical jewelry box that has 5 drawers, each with different shape partitions. I never imagined I’d want it, but now that it’s mine I find it indispensable! I’m able to keep more than 50 pairs of earrings in the earring drawer alone! Another great idea. Thanks for sharing!